I was cleaning up the Clever campsite after a long night of stomp and Lenape traditional dancing and wiping sleep from my eyes. It was time to get everyone in camp moving for our trip in town breakfast at the truck stop and showers in our tornado bunker motel. “That’s your cell phone ringing.” Someone in a nearby dome tent said. Too many calls go to my voice mail when the specially selected ring is not heard over the noise surrounding me. Tried the vibrating and sound alert but could not find a level of vibration listed as “Stun”. It would take a serious jolt of electricity to entice a response from me when immersed in the annual return to our Lenape roots. This call was from Mom. “I am watching the news on TV here in my room at the County Home. There are tornadoes all over Oklahoma. I raised you better than to have you go to a place like that. You put everyone in the motor home and come right back here.” She said. “The weather is beautiful weather here Mom. We had good weather all the 990 miles we traveled from home. Those tornadoes are probably far in Southern Oklahoma or waynorth in Kansas. Don’t worry. We are fine.” I said trying to re-assure her. “What? What? I can’t hear you.” She replied. She hung up her phone and I closed mine. It was most difficult to speak with her on the phone as her hearing was even worse than mine. This was going to be a beautiful 49th Delaware Powwow over Memorial weekend, not to hot, not to humid and not rainy or cold. Having attended this Indin gathering for twenty seven years all of the weather possibilities have been experienced, even a close call with a local tornado sweeping north of our camp and lifting two of our tents off the ground. It had been one of those hot humid powwows where we try to do everything on the powwow program in the three days before returning to teaching responsibilities at New Mexico State. Young Son Joe was determined to stay awake long enough to do the stomp dance after midnight. His mother stayed with him while those family members worn out from the dancing and events returned to camp for some rest. Our tent had an addition on one end as a sleeping cave for our young sons. Eight year old son Daniel crawled into his sleeping bag in the tent cave and was asleep by the time my head hit my pillow. Was it a dream or was our tent beating like a human heart. I awoke to the sound of nylon sides of the tent pulsing and someone yelling, “We have got to get out of here. 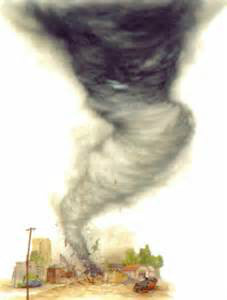 Wake up!” The boy’s mother opened the tent flap door and shouted, “A tornado is coming! Daniel was sound asleep through the coming storm. I dove through the tent cave opening and pulled him by his legs out of the tent. In the faint glow of the camp lights I saw our friend Thea in her small brown dome tent floating back to the ground. She was unharmed and told us the powerful wind lifted the tent where she was sleeping into the air. Thea spread her arms and legs as wide as possible on the tent floor hoping she would not fly up in the clouds. No tornados were going to come to our camp this year! We were going to have one of the best camps and Powwow dances ever before traveling to New Mexico for a distribution ceremony of my son’s mother and grandparents. It would be another nine hundred miles of motor home travel to the Land of Enchantment and a twisted road climb up the backside of the Sandia Mountains to the Crest where we would meet friends and family for the ceremony event. It had been ten years since the deaths of the boy’s mother and her parents. All of our family agreed it was time to return the ashes to a place overlooking the City of Albuquerque at a place loved by them. Having two grown sons to help with the long driving hours was a real blessing as long as they followed the G.P.S. and did not do any off-roading. It had been one of the best Delaware Powwows we had attended when my grandson and a good friend from Albuquerque came to our camp. Grandson Thunder and friend John had not seen for many years and our trip back to New Mexico would give us time to tell all the old and new stories. In Albuquerque, we enjoyed the great Mexican food, breakfast at the Frontier Diner across from the University of New Mexico, turquoise skies, tourist shopping in Old Town and desert scenes. I put on my new Roswell Alien tee shirt for good luck as we said sad goodbyes and began the two thousand mile return trip to Bear Lake, New York. Climbing the mountains out of Albuquerque, I-40 unrolled across the sagebrush and pinion treed high desert past Tucumcari, paralleling historic route 66, and across the flat lands of the Texas panhandle. Clear skies followed us past Amarillo and its Texas restaurant home of the world’s largest steak until we passed the Welcome to Oklahoma border sign with its resident dead armadillo on the side of the road. You know I have never seen a live armadillo in all our southwest travels. Most are on their backs with their feet up in the sky. Gray-black storm clouds began to fill the sky from the south. “Dad, all the trucks are pulling off the highway ahead of us.” Joe said. “Just find the first exit you come to and follow them. See if you can spot some sort of shelter for us and the motorhome.” I said. Far in the southeast the gray-black clouds were turning shades of emerald green with rings of pale yellow. The storm clouds looked nasty drifting north across I-40. Trucks and cars lined the access and exit road as we drove off the interstate. A large spoil pile of road asphalt several stories high bunkered the edge of a two lane road over pass above the interstate highway. People were gathering on the bridge looking east toward the massive storm. Sunlight broke the clouds above as Joe pulled our RV can behind the spoil pile. This was all the protection available on the flat rolling grasslands leading to Oklahoma City. The weather warning radio on the dash was screaming “tornado…tornado…tornado…take cover” as we rolled to a stop. Other cars and trucks were pulling into our spoil pile nest as we exited the motorhome and climbed the pile for a better look for possible tornado protection. There seemed to be no sense of alarm as people gathered by the road and looked east toward the storm. It was more like they were gathering to stare at the wreckage of an automobile accident with all the police and EMT lights flashing and sirens blaring. The gathering reminded me of a tailgater before the gates opened at a rock concert or football game. This could be an accident the spectators would be in if the storm headed west. There was not much to hide in or under around the asphalt pile. If all the people gathered had decided to hunker down under the overpass it would be standing room only. The watching hour passed uneventfully. Some of the teamsters returned to their trucks and drove back onto the I-40 interstate. The sun breaking through the scattered clouds above us was enough encouragement for us to join the truck convoy back on the highway. After all, truckers have computers and weather monitors. They certainly would not jeopardize their expensive eighteen wheelers and cargo if there was danger ahead on the interstate. Joe got behind the wheel and we headed for Oklahoma City our chosen destination for this day. Fifteen minutes later we saw a black and gray wall across I-40 like a curtain of death descending. Rain and hail hammered our motorhome as the valiant windshield wipers tried to keep up so Joe could see the road. We began to see cars off the road in the middle of drainage ditches with their flasher lights on. Heavy winds whipped the RV from side to side as Joe struggled to keep it on the road in a straight line. A green highway sign appeared in the blur of waves of rain. El Reno Exit 1 mi. Could we make it? Now we were the only moving vehicle on the highway. If we did make it what would there be in El Reno to shelter us from the tornado ahead? There was a collective sigh of relief when the exit ramp appeared. “Now Joe, get us off this road. Dan, keep your eyes peeled for someplace where we can find shelter for the RV and us. El Reno businesses began to appear along the sides of the rain swept road leading into the town. The stores were dark. None seemed to have electricity. “Dad, there is a Wal-Mart on our left.” Dan said. Joe pulled in the Wal-Mart entrance and found a place between two eighteen wheeler trucks to tuck in our motorhome. The Wal-Mart building formed a U shape on one side between the tire department and delivery docks. If we needed better shelter from a tornado it could be found by moving the RV between the buildings. Right now it was more important to see if we could weather this storm in the store. We grabbed the plastic ponchos found in the camper and headed to the front doors of the store. Running through the rain, we were met by Wal-Mart employees heading for their cars. Joe pulled on the door until he heard a voice on the other side shout, “We are closed. You can’t come in.” So much for this port in this storm we needed a plan “B”. There wasn’t much choice. Wendy’s and all the other business were dark and locked tight. We made a run through the rain across flooded parking lots and streets with the pelting rain making fun of our emergency poncho protection. Shoes and jeans were soaked by the time we reached the restaurant. Brahms is really just an ice cream and deli store with a few tables and booths now filled with rain soaked refugees. Lines of hungry people pressed the few waitresses with their orders. It was a miracle this business had the use of a generator to keep the lights on let alone cook for the gang of customers now flooding the store floors with storm water from their clothes. The boys found a table for us while I stood in line with a food order. The family in the table next to ours had no rain gear. One man in a cut-off, tee shirt was shaking wet and cold. I put my dry sweat shirt on his shoulders hoping we would not see a case of hyperthermia while we gulped down our gourmet meal of burgers and soggy fries. He seemed not to notice my shirt loan as it soon slipped behind the booth back. “Well boys, we don’t have much choice of a tornado shelter here it seems. The glass windows of this restaurant would shower all with glass fragments like an IED if this wind gets much stronger. Seems our only choice would be to return to our motorhome and ride it out in there. We can tuck it tighter to the Wal-Mart building if the stormintensifies. We slogged back to the RV, stripped off the wet clothes and tried to warm up with a hot drink from the microwave. Sleep was not going to come easy as we listened to the winds howl and the motorhome do its rock and roll. If it got just a bit shakier it would be time to move closer to the Wal-Mart buildings. Tired eyes closed. In the morning the rain and tornado storm moved on and so did we. Back on the Interstate I-40 no more than five minutes from our turnoff into El Reno the previous evening, we were able to see how close we came to be tornado fodder as this super storm crossed the highway. Epilogue: The National Weather Service on Tuesday announced that the twister that hit El Reno was a top-of-the-scale EF5 twister – the second to strike the area in less than two weeks. Friday's tornado was initially rated as an EF3. But the agency upgraded that ranking after surveying damage and concluding that the storm had winds of 295 mph. Nineteen people died in the storm and subsequent flooding, including three storm chasers. The twister marched through the countryside between El Reno and Union City, a region of largely rural farm and grazing land. Most of the destruction came toward the end of the tornado's 16.2-mile path along Interstate 40, where several motorists were killed when their vehicles were tossed around. In El Reno, the city of 18,000 suffered significant damage, including to its vocational-technical center and a cattle stockyard that was reduced to a pile of twisted metal. But Mayor Matt White said it could have been worse had the twister passed to the north. "If it was two more miles this way, it would have wiped out all of downtown, almost every one of our subdivisions and almost all of our businesses," White said. "It would have taken out everything." Storm chaser and meteorologist Tim Samaras, his storm chaser partner Carl Young, and his son Paul Samaras, were among the 11people killed in the latest round of tornadoes and severe weather to hit Oklahoma Friday night. They were killed near El Reno in an EF3 tornado with winds up to 165 mph that ripped through the Oklahoma City area during rush hour. Mothers are never wrong. When she called we should have loaded everyone in the RV and hustled back to home. I am sure it will be better Okie weather for the 50th Delaware Powwow next year. See you there Memorial weekend in May.